In the Jaguars short 14-year existence there have been few in between seasons. Jacksonville already boasts five seasons of 11 or more wins including a 14-win campaign back in 1999, but has also been through five seasons of six or fewer wins. However, the more you look at the Jacksonville roster this year and the additions and subtractions from last season, it looks more and more like those double digit win seasons are a thing of the past. Jack Del Rio has won only one playoff game in his six years on the job and it seems evident that the Jaguars do not have what it takes to compete with the Titans and Colts of the AFC South. Heck, after last season's 3-3 start turned into a 5-11 debacle, it looks like the Jaguars are falling behind even the Texans. From top to bottom this year's edition of the Jacksonville football team appears to be in disarray. From the coaching staff, loss of veteran leadership, regression at the quarterback position and more questions than answers on the defensive side of the ball, this season has all the makings of a horror show. We will start with the coaching staff where Del Rio seems to still be there only because he was given a more-than-generous four-year contract extension before last season. After NFL Draft picks gone bad year in and year out, Del Rio's draft control was greatly minimized if not totally eliminated. Moves made by the Jags that scream rebuilding include letting loose Fred Taylor, Khalif Barnes, Drayton Florence, Jerry Porter, Reggie Williams and Matt Jones. The only thing that may hurt more than the loss of Matt Jones and Fred Taylor on the field is the leadership brought to the table by the veterans in the locker room. In the NFL there is no "punting" per say on an entire season, but do not let anyone fool you, this season has all the makings of just that. 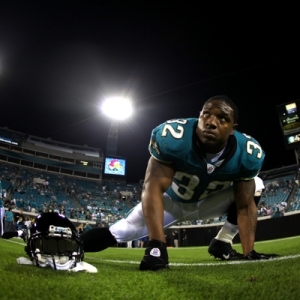 Fred Taylor was the second leading rusher on the team last season. Matt Jones was the leading receiver, which now leaves Maurice Jones-Drew as the team's leading returning pass catcher -- a distinction not generally given to a running back. On top of coming back as the leading returning pass catcher Jones-Drew will also have to deal with the added responsibility of being the lone guy in the backfield rather than sharing the stage with Taylor as he has the last three seasons. The aging Torry Holt, now in his 12th season, may still be a serviceable wide receiver but he is obviously incapable of carrying a passing attack that relies on David Garrard (15 TD, 13 INTs last season) and a shaky-at-best offensive line. The pieces on the offense just don't add up to a cohesive unit and the defense has declined each year since being the second-best unit in 2006. Two years ago the Jags D ranked 12th and last season fell to 17th, thanks to a 24th ranked pass defense. 2009-10 Jacksonville Jaguars Predictions: The season could start off in a bad way for an undermanned Jaguars team as it travels to Indianapolis in the opening week of the season before hosting defending NFC champions Arizona in Week 2. After the tough start the schedule eases up with the rest of the NFC West on the slate along with games against the Browns and Chiefs. Even with the easy schedule the eight wins projected as the over/under will be hard to come by as will another year coaching for Jack Del Rio will be. Before the point spreads become inflated if the Jaguars lose early and often a smart football pick each week would be to fade the rebuilding Jaguars.